Commonly known as the Bay tree, Laurus nobilis has wonderful aromatic evergreen foliage. The glossy, slender leaves not only look and smell good, they are also great for adding flavour to foods such as stews and soups. Further interest is provided with clusters of small yellow-green flowers that are popular with bees in spring. These are followed by ornamental black fruits. 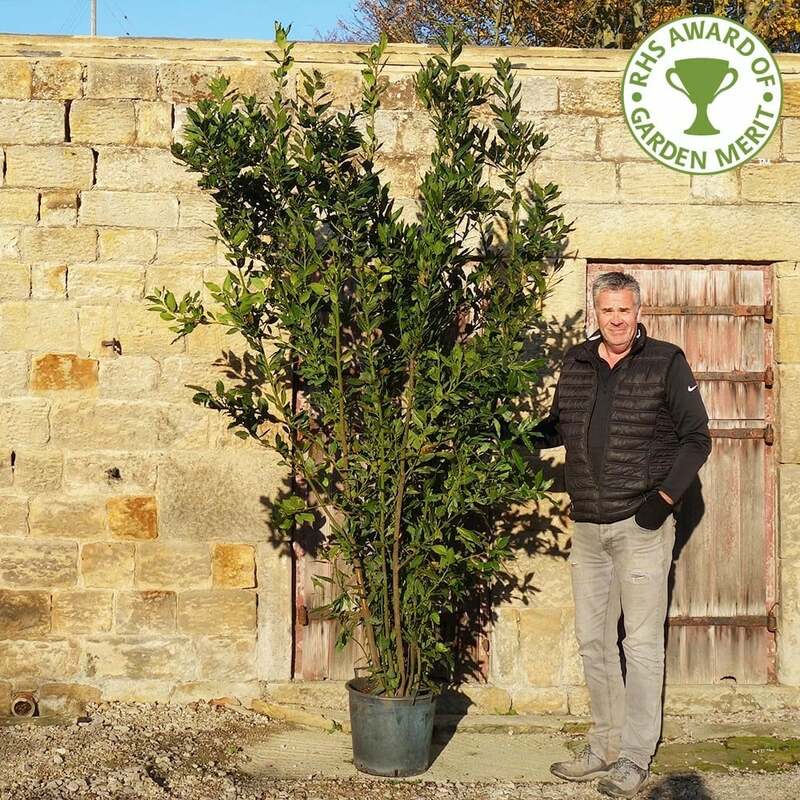 Excellent for providing evergreen screening or shelter, Bay Laurel can cope with exposed positions if it is not in a northerly climate. This Bay tree benefits from pruning to create fresh growth, but if left unpruned you can expect a height and spread of around 6 x 4 metres in 20 years. Plant in full sun or dappled shade and enjoy the wonderful fragrance when you brush past. Bay Laurel can be planted at any time of year. Begin the preparation by removing weeds and grass within a metre of the intended planting hole. Dig a square hole slightly deeper than your root mass and approximately 2-3 times as wide. To help the tree establish more effectively, we advise applying root grow by sprinkling into the hole at this point. Gently loosen the tree roots and place into the planting hole. Use 50% of the original soil and 50% compost to fill in the hole. Firm around gently, taking care to avoid banking soil up around the collar of the tree. We recommend planting trees using a stake and tie kit. The help & advice section has step by step guides and videos. If you’re planting Laurus nobilis in spring or summer, water well and regularly for the first few months. Keep an eye on young trees and increase watering if there are extended periods of hot or dry weather. Keep the area free of competing weeds and grass for the first couple of growing seasons.